In 1980, Dame Peggy Ashcroft, a house guest of Molly Keane, asked her friend for something to read. 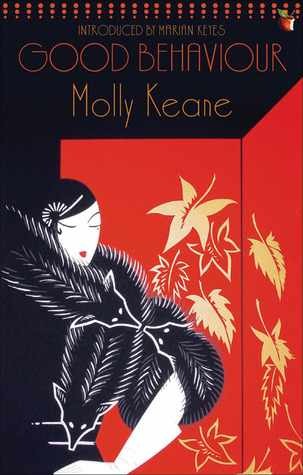 Molly produced an old manuscript which “had been turned down flat” by her erstwhile publisher and been languishing in a drawer, its author having written nothing since. Dame Peggy was enchanted by the novel and begged her hostess to try once more to have it published. As a result, Good Behaviour, a merciless portrait of the emotionally repressed landed gentry, saw the light of day. Moreover, it was published under her own name rather than earlier novels and plays (written to supplement her dress allowance) for which she had used the pseudonym of M.J. Farrell “to hide my literary side from my sporting friends” in early 20th century Ireland. The novel opens, shockingly, with the murder of the invalid mother of Aroon St. Charles. Rabbit mousse is an unlikely weapon, but forced upon the old woman by her fifty-seven year old daughter, the resultant vomiting is sufficient to kill her. An unpleasant scene with the elderly maid, Rose, who has served the St. Charles family for umpteen years, and who is distraught at the death of her mistress, causes Aroon to consider their past life and to try and come up with some reasons for her present situation. And so we begin to learn something of this dysfunctional, Anglo-Irish family and its unreliable chronicler. While local tradesmen fume at their unpaid bills, the St. Charles family exists in a state of decaying grace behind the magnificent walls of Temple Alice, the remaining ‘miserably few hundred acres’ farmed by Papa clearly inadequate for their needs. He lives for his hunting, fishing, shooting and women. Mummie is afraid of horses, loathes the aristocratic social life in Ireland and lives for her gardening and painting, ‘making almost anything she painted look preposterous and curiously hideous too.’ Neither lives for their children, although Hubert, who grows up to be a good shot, fly fisherman and horse rider, is approved of by both. To the extent of deciding not to allow her (and pay for) a London season, nobody seems to approve of Aroon, the large and unlovely daughter, whose blind misinterpretation of events and tragic self-delusion permeate this story. Molly Keane’s genius lies in making sure that we, the readers, are in no doubt as to what is really taking place, how ever Aroon describes it. When Richard, the son of Papa’s old associate Wobbly Massingham, and college friend of Hubert, arrives at Temple Alice for the Dublin Horse Show, Aroon is all too easily persuaded that he is in love with her, although we know perfectly well that he and Hubert are lovers. The scene in which Richard noisily gets into Aroon’s bed so that Papa will hear them and be put off the scent would be hilarious were it not so pathetic. In Aroon’s narrative, layer upon layer of subdued and dangerous secrets and scandalous activity is quite unconsciously uncovered while, through it all, the ‘good behaviour’ of the family members, even in the face of grief and personal loss, is strictly observed. In the end, this facade becomes all that they have. We were almost unanimously delighted by the novel.